First full-lenght for the motorcharged speedmetalpunx! Eight hymns of sleazy post-apocalyptic motorcharged speed-crust with a huge dose of mega-vault rock'n'roll metal madness!!! For lovers of English Dogs, Sacrilege, Warfare, Tank, Antic Cimex. Their previous releases are already collectible items, act fast with this one. Regular version comes with printed inner sleeve, 2 sided poster and sticker. 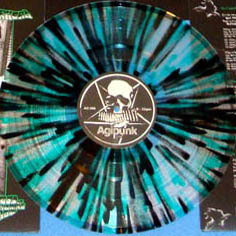 200 copies will be on green/black splattered clear vinyl + obi + esclusive fanzine with interview. Cover artwork by Chany. Metalpunx squads around the globe are warned, the apocalypse is near, fuel and vinyl to survive!